The Dean of the Medical Faculty Prof. Christoph Josten during his opening speech at the ICCAS Status Seminar 2018. 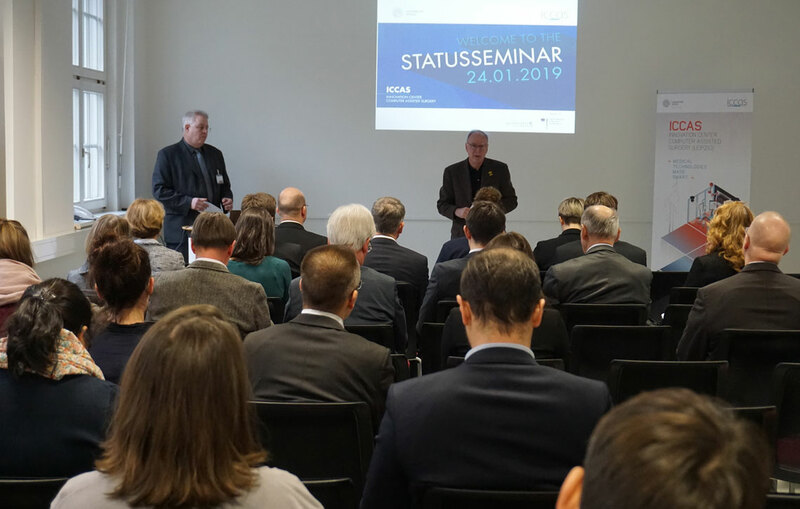 On January 24, the Dean of the Medical Faculty, Prof. Dr. Christoph Josten, opened the ICCAS Status Seminar 2018. It was attended by numerous guests from science, politics and associations, the health industry as well as the members of the board and scientific board. He praised the view of the institute for the implementation of scientific results to direct patient care as well as the good public perception. The Dean compared the ICCAS with a young tree, which has to be well maintained by the faculty in order to become strong. The guests were able to convince themselves of the 2018 successes on the basis of the group leaders’ results reports and the subsequent live demonstrations. The projects MoVE, IMPACT and AutoSON were presented. 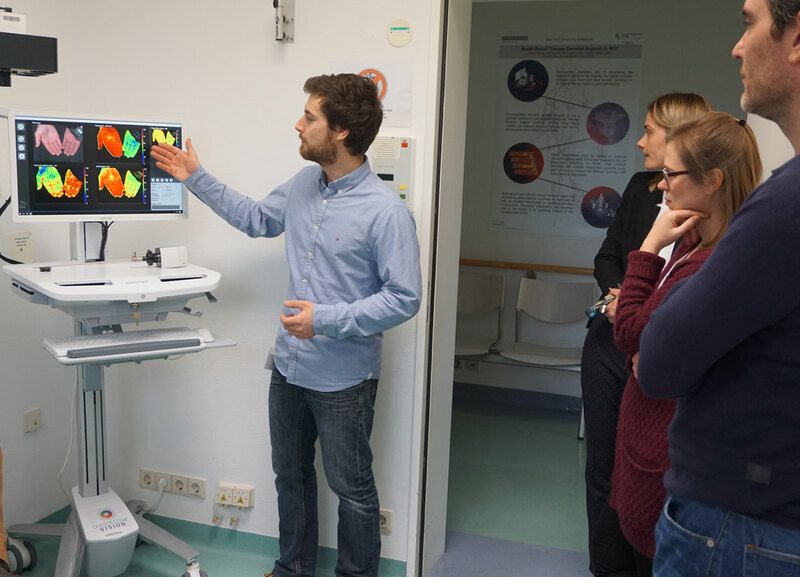 Scientists of the Digital Patient Model – group presented their software system as it will be used in the tumor board of the Leipzig University Hospital this year. Furthermore, the progresses of the project SONO-RAY as well as an application of medical robotics were presented. We thank all guests for their interest and cooperation and look forward to an inspiring and interesting year 2019. ICCAS’s results and activities in 2018 can be read in the new Annual Report 2018. A look inside is worthwhile! The group Life Support Systems during the presentation of the project IMPACT. 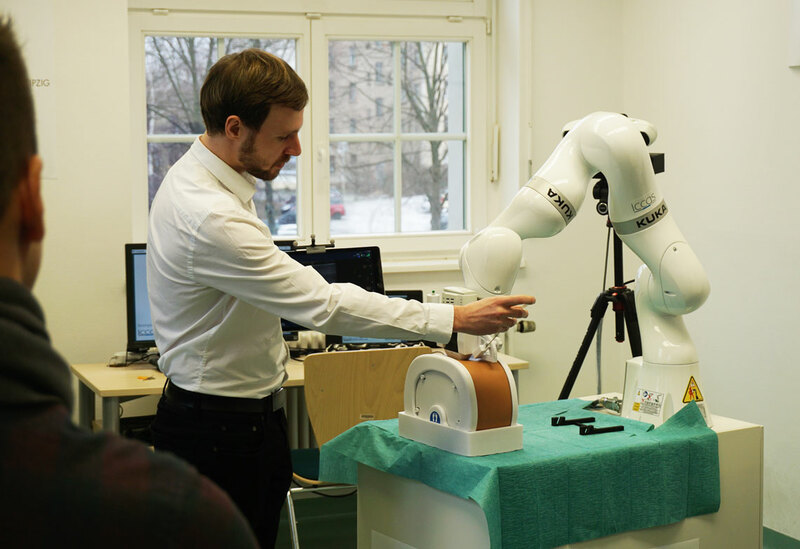 Johann Berger explains the advantages of using robotics for biopsies to guests. Hannes Köhler shows the mode of operation of Hyperspectral Imaging for the planning of tissue transplants.